Amortization can be a confusing tax term. It's similar to depreciation, and it works like depreciation, but it's used for different kinds of business assets. Amortization actually has several meanings. In relation to loans, it's the process of paying down the loan by making payments which include both principal and interest. Amortization also spreads out the expense of an asset over a period of time for tax purposes. Depreciation and amortization use essentially the same process but for different types of assets. While depreciation expenses the cost of a tangible asset over its useful life, amortization deals with expensing intangible assets like trademarks or patents. Amortization is similar to straight-line depreciation. The cost of the asset is spread out in equal increments over the years of its life. An amortization schedule is often used to show the amount of interest and principal that's paid on a loan with each payment. It's basically a payoff schedule showing the amounts paid each month, including the amount that's attributable to interest and a running total for the interest paid over the life of the loan. You can use an online loan amortization calculator to find the monthly payment on a loan before you commit to it. You'll need to know the amount of the loan, the interest rate, the amount of any deposit you intend to put down, and the term or length of the loan. You can then get an estimate of what the monthly payment will be. For example, if you take out a $400,000 loan for 15 years with 20 percent down at a 5.25 percent interest rate, the monthly payment will be approximately $1881. You'll need the value of the asset and its estimated useful life to calculate amortization for an asset. Its useful life is the time period over which it's expected to be of use to your business. The amount amortized is the same for each year so the calculation is relatively simple. For example, a company might have a patent that it spent many years and $1 million in costs to develop. The patent's useful life is estimated at 15 years, so the company can claim $66,667 in amortization expense each year. Amortization is a legitimate expense of doing business and this expense can be used to reduce your company's taxable income. 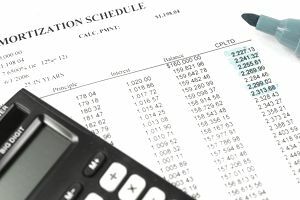 The current year's amortization expenses, like depreciation expenses for the year, should appear on your company's income statement or profit and loss statement. An amortization calculation is included when a company prepares its income tax return for all allowable assets that are being amortized. IRS Form 4562, Depreciation and Amortization, is used for the calculation. The form includes both depreciation and calculation of depreciation for listed property as well as amortization. New assets are listed first, then assets that are continuing to be amortized are listed next. The calculations are then transferred to the main tax return form, which can vary depending on the type of business. Business startup costs are treated somewhat differently. The IRS requires that startup costs be amortized, but it does allow up to $5,000 of startup costs to be deducted during the first year of business.